The Virginia football program has made a lot of progress over the course of 34 games in the Bronco Mendenhall era. I’ve listed off some of those steps forward throughout this season. The biggest two so far in 2018: earned bowl eligibility in back-to-back seasons for the first time since 2004 and 2005 and secured at least four ACC wins for the first time since 2011. Opportunities for three more milestone steps remain this season, though. Obviously, the streak against Virginia Tech in the finale is one. Winning a postseason game for the first time since 2005 is another. The third is to post a winning record for the first time since 2011. That last one makes this week’s game with Liberty a big one. The Hoos own a 6-3 record entering this week’s 3 p.m. contest at Scott Stadium so a win would guarantee a winning record. As UVA’s fourth and final non-conference game, defeating LU would also finish off that part of the schedule with a 3-1 mark. This is the first meeting in football with Liberty, which is making the transition to the Football Bowl Subdivision level. The Flames have been locked in scoring showdowns in recent weeks. Opponents average 38.2 points per game, while Liberty averages 36.9. Recent scores this season have included a 52-43 win against New Mexico, a 49-41 loss to New Mexico State, a 48-41 win against Idaho State, and a 62-59 triple over time loss to UMass last week. Those scoring numbers may be a little bit concerning with the injuries that piled up on defense again against Pitt. Mandy Alonso is out of the season, Malcolm Cook has called it a career, and Brenton Nelson and Joey Blount are potentially doubtful. Juan Thornhill could play, but he won’t be 100%. That’s all on top of news from earlier this season that sidelined Richard Burney and Chris Moore for the year. Still, the Cavaliers should match up OK against Liberty’s biggest strength, which is the passing game. Quarterback Stephen Calvert has thrown for more than 7,000 yards in his career with 62 touchdown passes. Receiver Antonio Gandy-Golden enters this game off a nine-catch, 205-yard showing last week and he’s closing in on back-to-back 1,000-yard receiving seasons. He had 1,066 yards and 10 touchdowns last season and he’s already put up 844 yards and nine touchdowns this season. UVA can match up with cornerback Bryce Hall, who leads the nation with 18 passes defended this season, and corners Tim Harris and Darrius Bratton. If Thornhill does indeed end up available to play, that’s four options in the secondary that have played well all season long. If Virginia is going to check off the winning record box this week, however, the offense needs to hold up its end of the bargain. Liberty has not been able to slow down most opponents this season and UVA’s skill players should be able to exploit openings. This is a good opportunity to not only push Olamide Zaccheaus toward the 1,000-yard receiving target for the season (he’s at 721 yards with three regular season games to play), but to get other players going too. The Hoos are coming off a game where Pittsburgh piled up five sacks, while it also hemmed in dynamic quarterback Bryce Perkins. Last week Perkins also ran himself into big losses. Those five sacks led to 46 lost yards. He’s going to take some sacks trying to make plays, but he shouldn’t take that many and shouldn’t lose that many yards. It’s poor game management. The Cavaliers enter the game with 27 sacks allowed on the season, which is tied for 111th nationally among 130 teams. Both Perkins and the offensive line need to do a better job with protecting the pocket this week. Liberty can be a threat there. The Flames logged seven sacks against UMass last week and they have 12 in the past two games. They’ve posted 21 sacks on the season, a number that’s tied for 51st nationally. Defensive end Jessie Lemonier leads the way with nine sacks this season, including six in the last two weeks. The Cavaliers have chosen to block some ends in one-on-one situations with tight ends and running backs at times this season, but taking care of Lemonier and keeping the pocket clean needs to be a priority on Saturday. Liberty has rattled off 10 rushing touchdowns over the past two games and the offense has posted at least 40 rushing attempts in six straight games. So while the passing game gets a lot of attention, the secret for LU is to maintain a balanced attack to keep defenses honest. Considering that UVA has had some run fit issues at times this season, but has really excelled when shutting down the run, this is a big matchup this week. The front seven for Virginia needs to be accurate with its run fits, beat blocks, and make tackles to take away the run balance. If the Cavaliers can do that, a bonus would be to bother Calvert with limited rushers in order to keep more players in coverage. Ideally, four-man combinations with mixed looks can try to fluster the Calvert while also keeping the potentially dangerous receivers under wraps. Senior linebacker Chris Peace may be a key piece here in his final game at Scott Stadium. He leads ACC linebackers with six sacks, which is tied for seventh nationally among linebackers. As Greg Waters pointed out in his weekly grades, UVA lost the field position battle for the first time this season (the Hoos tied with Indiana in average starting field position) and the 12th time in the Mendenhall era last week. They’re 1-11 in those games. One way to win the field position battle is to win special teams. The Flames don’t look particularly daunting on special teams with the exception of a 13.2 punt return average. Lester Coleman and the Cavalier punt coverage group should be able to slow down the threat there. Liberty brings kickoffs back an average of 18.2 yards and its net punting average is 30.9 yards. Opponents have averaged 21.7 yards per kick return and 11.9 yards per punt return this season. With Joe Reed and Tavares Kelly as potential touchdown threats in the return game, the Hoos could swing field position and the scoreboard with a strong blocking effort in those phases this week. Six of Liberty’s eight opponents this season have racked up 500 or more yards and 38 or more points against the Flames’ defense. 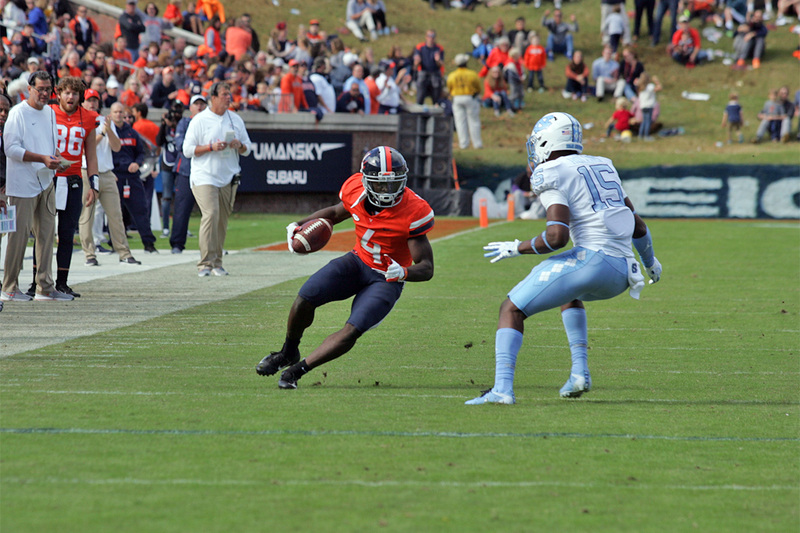 Virginia needs to come out focused with its foot on the accelerator from the beginning. There should be room to run the ball and pass the ball with multiple players. If UVA’s offense can carry the lead banner this week like this matchup suggests on paper, that could help an injury depleted defense as well. Simply put, there’s plenty to play for – from a winning record to limited reps for some players nursing injuries to Senior Day – so the Hoos need to come in and take care of business. Anything less than that would be a disappointing way to wrap up the home schedule this season. VIRGINIA 44, LIBERTY 24. Season to date: 5-4. Might a Liberty team that features a prolific passing attack be catching UVA at just the right time to spring an upset? Because of significant injuries on the D-Line and in the defensive backfield, Virginia’s defense isn’t the same unit it was entering the Pitt game. Depth is a major concern for the Hoos, but even with those questions, I see the defense holding the Flames under 30. Offensively, UVA should be in for a big day against one of the worst defenses on the FBS level. I think the seniors go out in style and the Hoos get their seventh win of the year. VIRGINIA 56, LIBERTY 28. Season to date: 5-4.